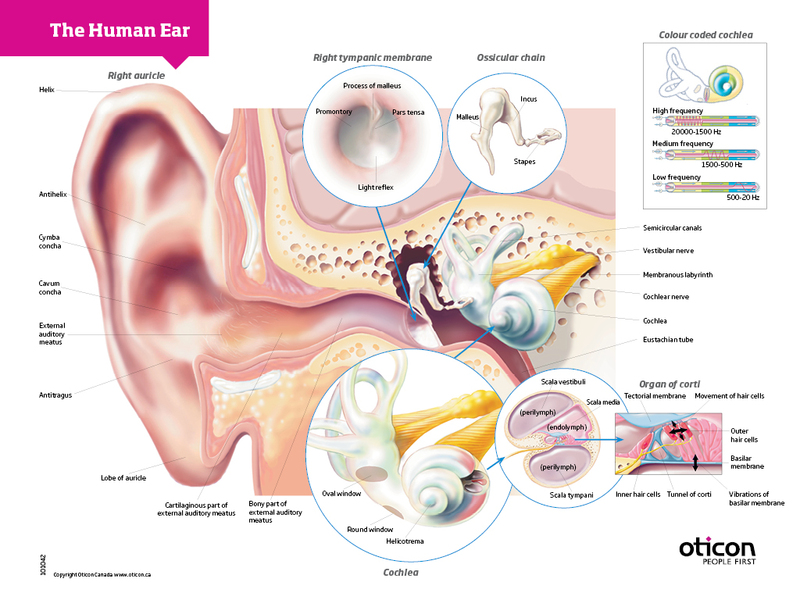 The Middle Ear is an air-filled space separated from the outer ear by the eardrum. It houses three little bones that form a chain to transmits sound to the inner ear. 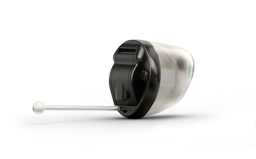 The Eustachian tube equalizes the middle ear pressure with the outside air pressure. Ear infections and other ear diseases often most commonly occur here and may be medically treatable. The Inner Ear otherwise known as the cochlea is filled with little hair-like cells that transmit frequency specific impulses to the nerve fibers. The semicircular canals responsible for dizziness are also in the inner ear space. The Vestibulocochlear/Acoustic Nerve transmits the impulses from the ear to the brain. The Auditory Cortex is in the temporal lobe of the brain it is this area that processes the nerve impulses so we recognize them as sounds and words. As we age our speed of processing sound worsens and can make it hard for us to understand what is said even if we can hear it. Hearing aid use in hearing impaired individuals is known to help maintain the neural connections and reduce the decline in processing speed. Sensorineural hearing loss is due to damage of the inner hair cells in the cochlea or nerve damage. This type of hearing loss is often caused by aging, noise exposure, and genetics. In the majority of cases this type of hearing loss is permanent and will only deteriorate with time. Conductive hearing loss is due to a blockage in the middle or outer ears that is preventing the sound from reaching the inner ear fully. This type of hearing loss occurs with ear wax, ear infections, ear growths, and issues with the bones and eardrum. This type of hearing loss is often temporary and can often be rectified with medical treatment. Mixed hearing loss is a combination of sensorineural hearing loss and conductive hearing loss. If the hearing test demonstrates a significant hearing loss we will work with you to determine your hearing needs and give you a recommendation for which hearing solution is best for you. We deal with eight major hearing aid manufacturers in order to provide you with a wide selection of hearing aid styles and prices. 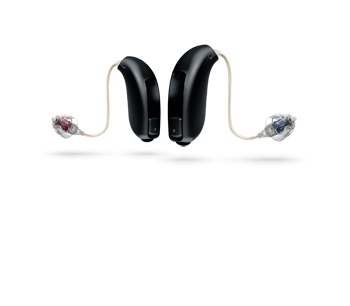 From discreet to powerful, we have your hearing needs covered. 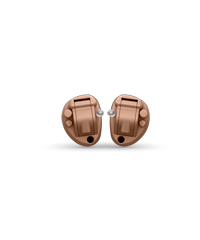 If your hearing aid is not working well, we are also able to repair and adjust all types of hearing aids, whether they are old or new, purchased at our clinic or elsewhere. ODSP(Disability Support Program)- hearing assessments(with referral), batteries, repairs, hearing aids, and some Assistive Listening Devices(ALDs). Infant Hearing Program-hearing assessments, loaner hearing aids, hearing aid programming and repairs. NIHB(Native Affairs)- hearing aids, batteries and repairs. VAC(Veterans Affairs Canada)- hearing assessments, batteries, hearing aids, ALDS, Spouses/Widows also qualify through the Legion’s poppy fund. Assistance for Children with Severe Disabilities- hearing assessments(with referral), hearing aids and financial support for the families of children with sensorineural hearing loss. Ontario Works-some entry level hearing aid coverage based on need. Benefit plans-most plans have at least some coverage for hearing aids and some may cover hearing tests/services by an audiologist. Some retired individuals and their spouses also retain their benefits. Canadian Hard of Hearing Association(CHHA)-Individuals who demonstrate financial need are able to apply to the Hear Now fund. The Lions club and Rotary Club have covered hearing aids for low income individuals in the past. Shriners/President’s Choice Children’s Charity provide coverage for hearing aids for children of low socio-economic status. If you are not yet a member of the above listed groups but believe you may be eligible, we can provide you with the application forms necessary. We accept payment for our services by cash, cheque, Debit, Visa, Mastercard and American Express.